Stay in the know on the latest motoring news, vehicle launches, exclusive promotions, and MINI Oakville happenings. Are you looking to buy cars for sale in Brantford? Are you intrigued by the premium quality of smaller compact vehicles like the MINI Cooper? Well if so, then MINI Oakville is the place where you need to be to buy cars for sale in Brantford! At MINI Oakville, we have made it very easy for our customers to find pre-owned cars in Brantford and quality information about those cars. If you are looking for second hand cars for sale in Brantford, then MINI Oakville is the place for you! Our dealership is located in very close proximity to Brantford so residents do not have to travel far to find our second hand cars for sale. Finding pre-owned cars in Oakville is easy when you choose MINI Oakville. Our MINI Oakville dealership is located on the South Service Road in Oakville which can be reached by getting off the QEW at Bronte Road. Looking for car prices in Mississauga is easy when you use MINI Oakville. Our dealership is located in very close proximity to Mississauga so residents in that area do not have to travel far for quality vehicles at very affordable prices. Finding used auto dealers in the Mississauga area is easy when you choose MINI Oakville. Our MINI Oakville dealership is located in very close proximity to Mississauga, and we have been proudly servicing Mississauga residents for a very long time. It is easy to look for used vehicles in Mississauga when you choose MINI Oakville. Our MINI Oakville dealership is home to high quality driving machines that guaranteed to give the driver an exhilarating driving experience. If you are looking for a used car dealership in Mississauga, you should consider MINI Oakville. Visit our website today to browse our selection of premium used vehicles. Safety, convenience, control, and a bodacious design are the values in which embrace. Established in 1916, they have built a reputation as being one of the most opulent and reliable services which aim towards customer satisfaction. Most of the used MINI vehicles you will encounter at MINI Oakville have only a few thousand kilometers on them. The engine will be in great condition and you will not have to worry about maintenance or anything like that. At MINI Oakville, we have a large inventory of new and pre-owned MINIs. All of our cars go through a rigorous testing process to meet our high standards of quality. The high-end materials and engine technology leveraged from the BMW Group not only help MINIs retain their resale value over the long-term but also make them very fun to drive. MINI Oakville offers affordable compact vehicles that elevate the driving experience for drivers and passengers with an incredibly exhilarating poise that exists in the ride. At MINI Oakville, we work hard to deliver impeccable customer service. If you're in the market for a new vehicle, we can help you discover a model that is just right for you. If you are looking for a great used MINI, we are the place to be. MINI Oakville's convenient location draws in customers from across the GTA and beyond, to take advantage of our great pricing and special offers. Finding a car dealership in Brantford that has a large inventory of new and pre-owned vehicles, world class customer service, and plenty of ways to access information about the dealership and it’s vehicles is simple when you choose MINI Oakville. If you are looking for something completely new, re-mastered, and re-engineered, then you should come into MINI Oakville and check out the all new MINI Convertible! If you are looking for certified second hand cars in Oakville then you should look no further than MINI Oakville. 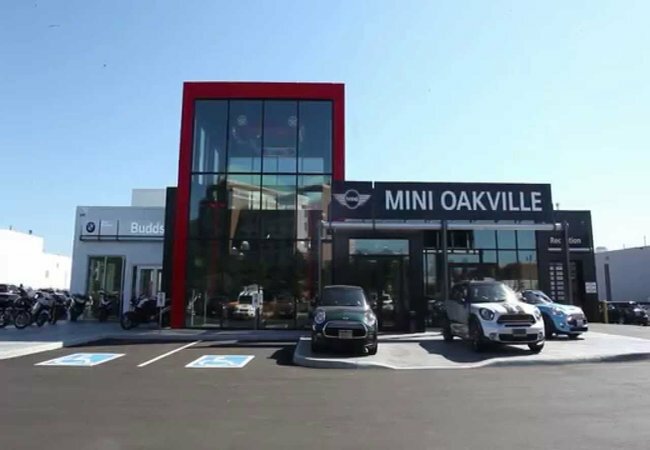 If you are living in Oakville and you are looking for a pre-owned vehicle in Oakville, then we recommend that you either come into our MINI Oakville dealership, or visit us online at our MINI Oakville website. Used cars for sale in Oakville are easy to find when you choose MINI Oakville. MINI Oakville is located on the South Service Road, which can be accessed by Bronte Road off the QEW. If you are looking for a quality MINI vehicle that touches on driving dynamics and design at an affordable price, you are in the right place to find a pre-owned or certified MINI. At MINI Oakville, we offer an extensive variety of vehicles that carry prospective elements which exhibit performance, safety, quality, and comfort. Our commitment to customer service allows us to facilitate a pleasurable car buying experience that our clients will be happy driving away with. Your search of buying cars for sale in Oakville starts at MINI Oakville. Come in and check out this beautiful pre-owned 2015 MINI Cooper S 5 Door in striking Deep Blue Metallic and Carbon Black Leatherette interior. From our extensive array of vehicles ranging from motorcycles to sportscars, our MINI vehicles share the quality specifications of performance and convenience for an affordable price. Modern-day MINIs are a unique blend of cool British style and impressive German construction and engineering. Not only does the MINI offer you a unique and dynamic driving performance, but excellent fuel efficiency, as well! Visit us at MINI Oakville and find out how our top quality pre-owned vehicles and dedicated associates make us different from all the other used car dealerships in Mississauga. The professional staff at MINI Oakville makes every effort to ensure that customers have a superior purchasing experience. You’re in the zone at MINI Oakville where we’ve made it our goal to serve the automotive needs of drivers near and far. Affordable compact cars are in a class of their own with an iconic design, versatile cargo room, and sporty performance. Whether you are looking for a new vehicle or service on your current one, MINI Oakville is the place to go in the GTA area. Stay informed about news, special offers, products and services from or on behalf of MINI Canada and MINI Oakville. Stay informed about news, special offers, products and services from or on behalf of MINI Canada and MINI Oakville†.